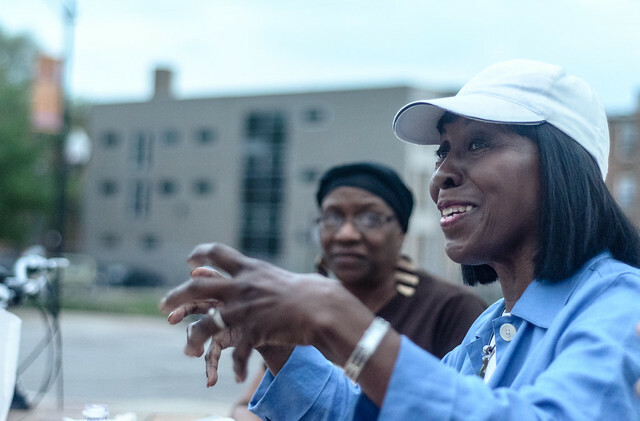 On Tuesday, July 15th, over 100 neighbors from South Shore and South Chicago gathered to demand a Community Benefits Agreement for the Lakeside Development. 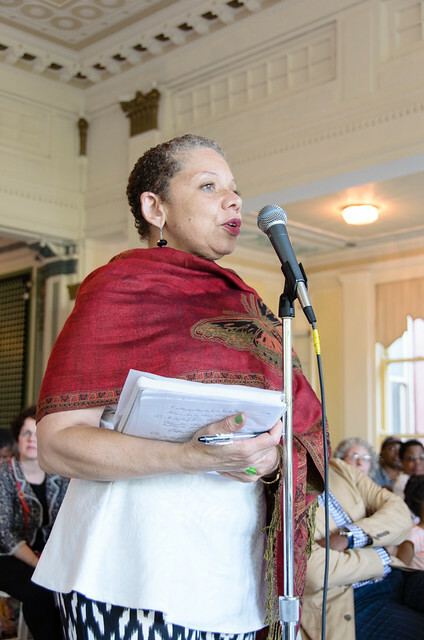 Coordinated by a coalition of organizations, a proposed CBA was presented to 7th Ward Alderman Natashia Holmes, who is supportive, as well as to McCaffery Interests, the developer. The document details many hopes and expectations for the development, both benefits it should provide to the existing community and harms it must seek to mitigate. View a draft here. See more coverage in DNAinfo. The slide image below also has ideas if you’d like to voice your support for the CBA. Walk – Dine – Shop South Shore! 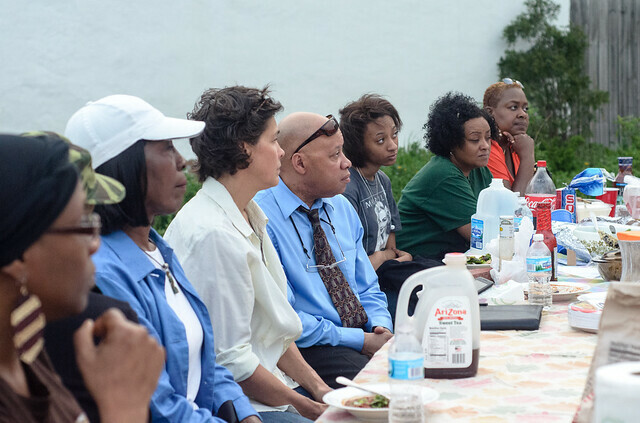 We are pleased to spread the word about the Planning Coalition’s neighborhood self-empowerment campaign. Make sure to support our great local businesses! If we reward quality and entrepreneurialism, we will get more of it. 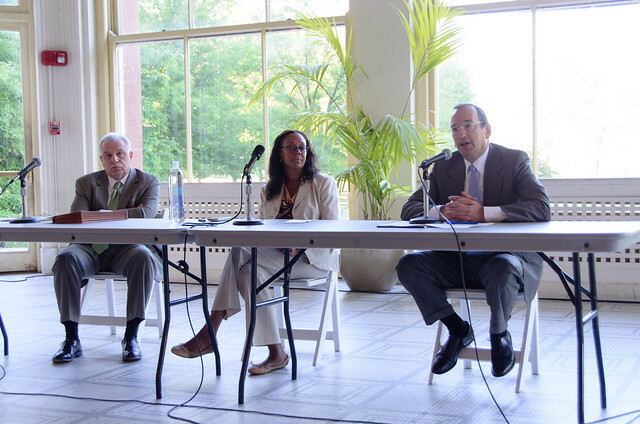 On Tuesday, June 3, 2014, 5th Ward Alderman Leslie Hairston convened a meeting at the South Shore Cultural Center to provide an update on the efforts to secure a new grocery store for South Shore, as well as on the status of the Urban Partnership Bank properties. Deputy Mayor Steve Koch and Commissioner of Planning & Development Andy Mooney were also present to speak. At least 50 South Shore neighbors were in attendance. Alderman Hairston opened the meeting by emphasizing that work is ongoing both to find a new grocer, and to make plans for the Urban Partnership Bank properties. She singled out Urban Partnership Bank for criticism for closing so rapidly, boarding up their building, and hiring a Bridgeport-based artist to paint it. 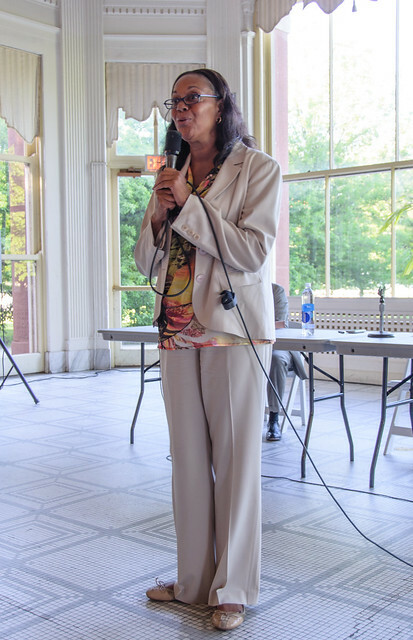 On the grocery front, she emphasized that the recalcitrance of the owners of Jeffery Plaza is the main sticking point. Deputy Mayor Steve Koch spoke on behalf of the mayor’s task force addressing the Dominick’s closures. 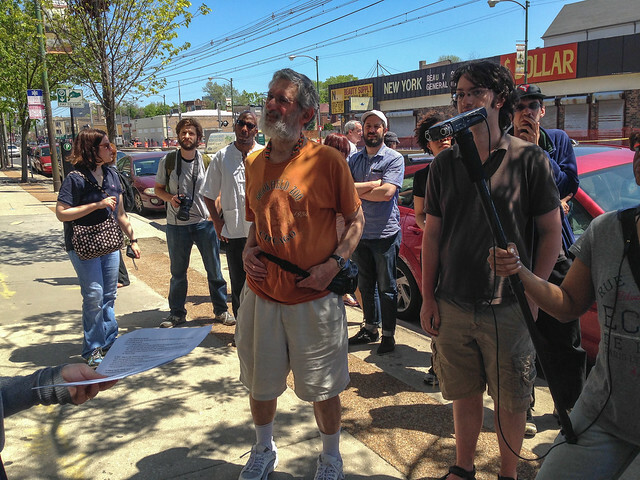 There is plenty of interest in locating in South Shore (4 grocers currently negotiating), but the plaza owners will not sell the grocery store building, and they are demanding very steep rent ($8 more per square foot than market in the neighborhood). Commissioner Mooney spoke briefly, mostly to underscore the two important announcements noted above. The Department of Planning & Development is very actively involved in this process. 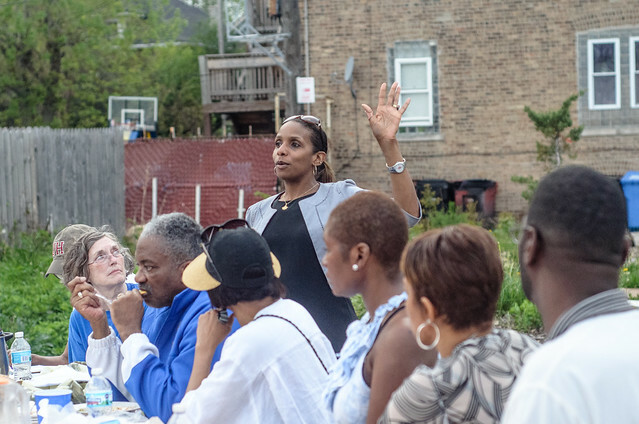 Neighbors queued up to ask a number of questions, touching on the urgency of the grocery situation, the need for public input and accountability, and the importance of developing and realizing a broad long-term vision for the revitalization of 71st Street and South Shore generally. Future updates will be provided at the regular 5th Ward meetings – the next is Tuesday, June 24 at La Rabida Children’s Hospital. For additional photos, click here. To read a live blog of the meeting, click here (you will need to join the Reclaiming South Shore for All group on Facebook first). Good News in South Shore! A number of exciting positive developments to report on this lovely Memorial Day. The delegation from South Shore won first place at the Neighborhoods USA conference this past week! Congratulations to Mary Steenson for drawing national attention to positive work happening in South Shore. Of course, those of us who live here know something special has been happening at 75th & Coles for a while. 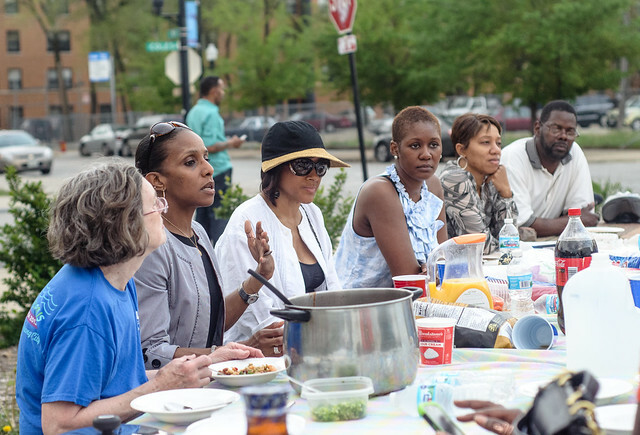 Just a couple of weeks ago on May 12, nearly 30 people gathered at the communal picnic table for a conversation about the community. Focuses included addressing problem businesses, as well as organizing to make sure the Lakeside development doesn’t negatively impact South Shore. 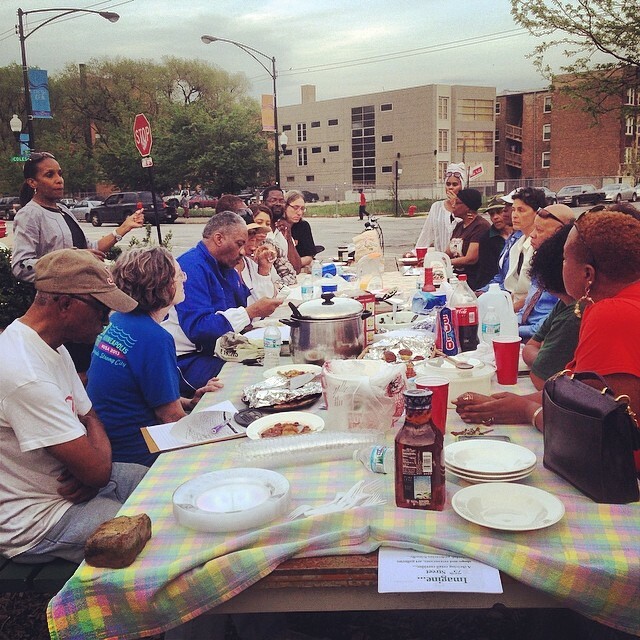 The conversation was part of the Chicago Community Trust‘s #onthetable2014 initiative. A great time (and great food) were had by all – stay tuned for announcements of future pot lucks at the garden this summer! 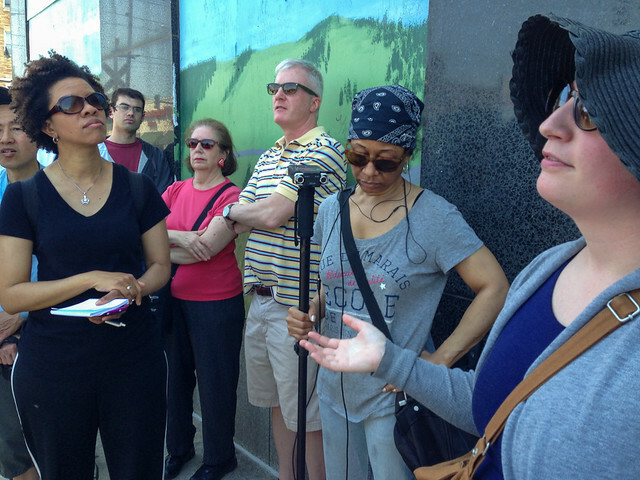 Finally, on Sunday, May 25, the second Historic 71st Street Walking Tour took place. 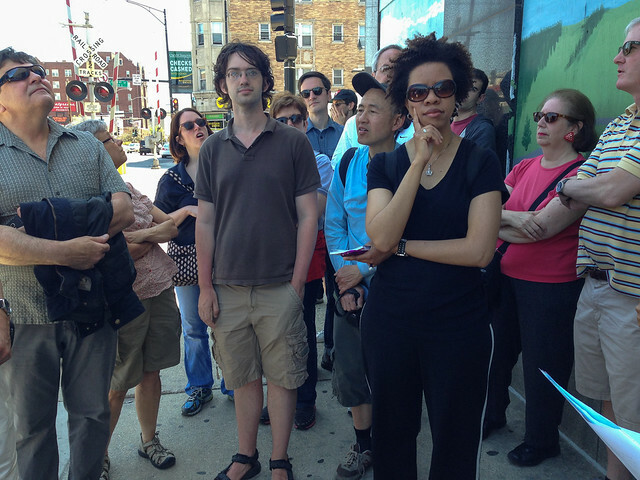 26 people from around the city took part and learned about South Shore’s historic architecture and the importance of preserving what makes the neighborhood beautiful and unique. If you haven’t already signed the petition to create a Landmark District on 71st, do so now – we will be presenting it to elected leaders this week! 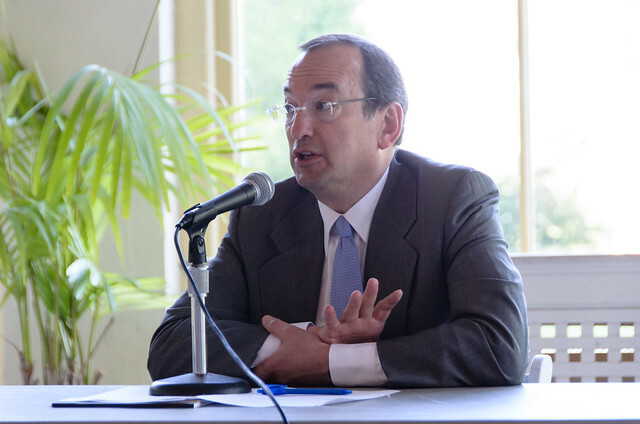 Alderman Holmes, Alderman Pope, and McCaffery Interests held an update meeting on the Lakeside Development on May 13, 2014. 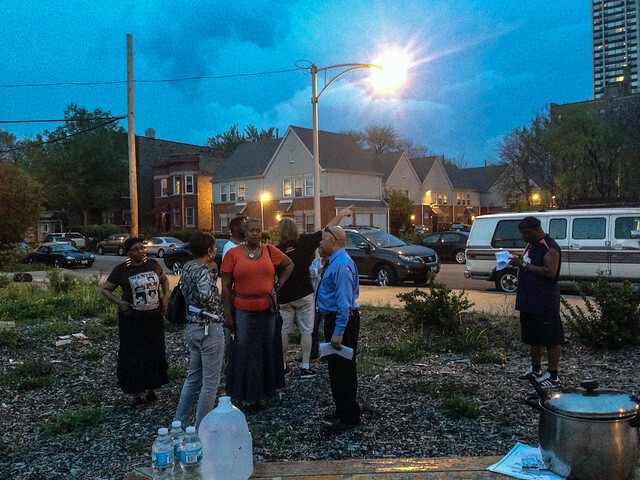 More than 100 local area folks attended, including representation from Reclaiming South Shore for All. In our opinion, it was clearly a dog-and-pony type performance by McCaffery’s Senior Project Manager, Mr. Dan McCaffery, Alds. Holmes and Pope and a “community representative” who is involved in the project. They didn’t offer much in the way of substantive current news on progress of the project. It was clear that none of them support the ideas promoted by the grassroots Coalition for a Lakefront Community Benefits Agreement. It looks like a business-as-usual approach between the elected officials and the private developer. 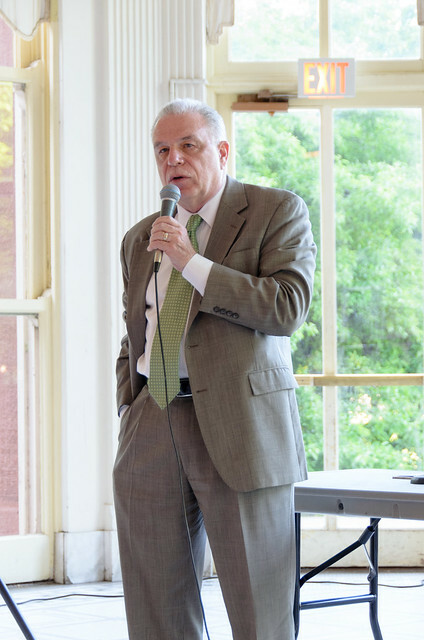 For example, Mr. McCaffery said that he and the aldermen are meeting with commercial businesses, such as Target, about buying into the project. However, he said he wouldn’t name any other names, and indeed plans to keep the details secret. Therefore, it appears that the Coalition has a very steep hill to climb to get any consideration for a CBA driven by community residents. Be sure to let your alderman know where you stand! If you missed the meeting and would like to view it, a video is available online and embedded after the jump. The proprietor of the business just east of Coles on 75th has not been a good neighbor. They opposed the painting of the peace mural on the wall (the building owner gave permission), and have parked their cars on that community garden. They have dumped grease and garbage on the garden lot as well. After a verbal altercation between the proprietor and several garden volunteers, the mural was destroyed. Rocks were thrown at it, cracking the plaster badly enough that it all must be removed. We will discuss and plan a response to this incident during this coming Monday’s potluck community discussion at the garden (see the Facebook event). Neighbors are invited to join. Keiana Barrett, who will be a candidate for 7th Ward Alderman next year, will be describing the need for a concerted community response to this destructive business (as well as another that has been identified at 76th & Coles). For those who can’t attend, below is a summary of the actions needed. Reclaiming South Shore for All’s New Logo! We are pleased to announce our new logo! The winning design was submitted by Arthur Wright. We will be rolling our logo out across our channels over the coming weeks. Arthur Wright is a South Shore resident with a background in advertising, and he has been working as an artist for at least 10 years (view his resume). He maintains studios in Bronzeville and South Shore, and he has done major design work to assist with the ongoing revitalization of Bronzeville. Please check him out on Tumblr to see more of his work, or connect with him on Facebook. Arthur is available for projects, and we at Reclaiming South Shore for All recommend him highly! Alderman Holmes, ALderman Pope, and McCaffery Interests (the developer) will be hosting a Townhall meeting on Lakeside Development NEXT TUESDAY, May 13, at 6pm, 8233 S. Exchange. Is environmentally sustainable and healthy. See our calendar for details on this event, as well as Lakeside’s next open house on August 14.